Amazon’s first runaway feature success, Manchester by the Sea (2016), made a strong contender for the Best Picture Oscar. Meanwhile, a smaller-scale independent coincidentally shares a few parallels in plot set up. While both touch lightly on related issues, Changeover is of gentler, more tender style. 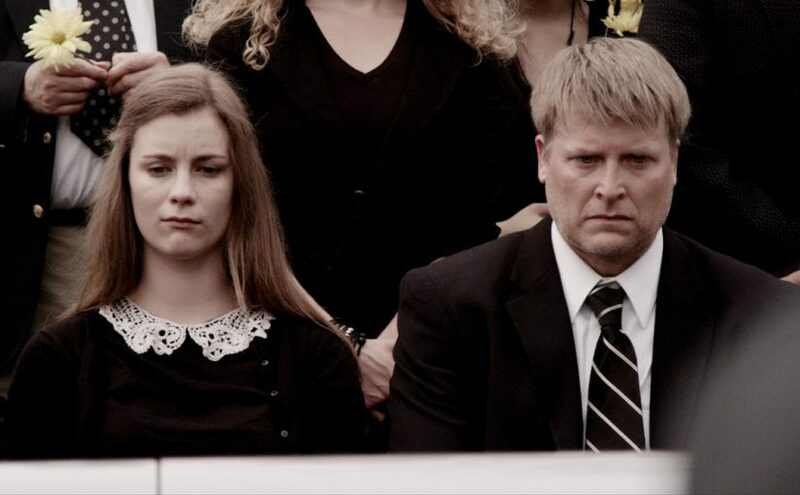 A horrific car-crash takes the lives of budding young musician Haley’s parents, an accident she survives by simple virtue of being in the back seat. She may be unscathed physically, but the mental scarring is all-consuming, overwhelming. Not only has she lost both parents; she’s witnessed the horror of the moment that claimed them. Her Uncle Chad’s life of tennis coaching is interrupted when face-from-the-past Michael drops by, bearer of both the tragic news, and newly orphaned Haley herself (Madeline Taylor). Sole remaining family member, Chad finds himself with an adopted teenage daughter. He’s still coming to terms with the break-up of his own marriage, already raising a pre-teen son on his own. In an instant, he’s reeling from the death of his brother and sister-in-law, and he has new responsibility for someone he barely knows. And after the unimaginable trauma that Haley’s gone through, she’s all but shut down. Changeover delicately tracks the shared journeys of Haley and Chad as each fight to come to terms with the loss of parents and sibling respectively, while negotiating a new life together. Forced into a relationship neither asked for by a sickening tragedy, it’s a road that feels simply impossible at times. As two strangers carefully traverse such sensitive new terrain, each confronts unprecedented challenges, while buried secrets become painfully unearthed. This is an affecting and altruistic portrait of the unfathomable impact of bereavement, and the real effects of post-traumatic stress. In a world where the practicalities of life demand to be satisfied regardless. A world where there is no option but to carry on. Even when you can’t. Madeline Taylor’s nuanced performance is restrained and perceptive, poignant when muted by pure shock, touching when she finds the strength to break that silence. It’s a highly accomplished first feature from writer-director Estes Tarver, also cast as Chad, in an appropriately underplayed depiction of sympathy and masculinity under pressure. At the sweet heart of the picture is his relationship with those around him, most notably his son. Carter Godwin, endearing and impressive young actor, gives a lovely performance as his kid. The cosy life he’s got used to with Dad undergoes a sudden tectonic shift, calling for a maturity beyond his years, and it’s nicely struck. In Chad’s relationship with Haley’s counsellor (Carrie Marshall), the question of the carer’s need for care remains eloquently unspoken. But the core dynamic is between him and Haley, particularly effective when he visits her in hospital, later when he softly re-introduces her to the idea of music, her formative love and talent. The story shines a desperately needed light on the taboos of depression, anxiety and self-harm, so potentially destructive in the impressionable young. It is testament to the acting and the writing that, despite the heart-rending subject matter, this is a heartening, uplifting play of warmth and optimism. Cathartic and compassionate, commanding a powerful message that belies the production’s size, it ardently articulates that everyone is at the mercy of mental health issues. We all have to deal with the fragility of mortality. Augmented by graceful instrumental themes throughout, it also strikes a chord on the restorative power of music, emphasised by actor Carrie Marshall’s evolving score. Change is the only constant. Rarely, but sometimes, that change can be unbearably brutal. This film’s essential, healing and strengthening message is that, with the support of loved ones and those able to offer care, the recovering capacity to changeover is there. In all of us. Great depiction. Thank you Tony!! This is one of the most erudite reviews I have read in a long time. Tony Lee has really captured the essence of the writing, the story and the key performances.